After spending weeks trying to get up the courage to go to the top of the Eiffel Tower at the request of my niece, I went to make reservations, and it was fully booked. Whew! I do not like heights at all, so I didn’t mind. 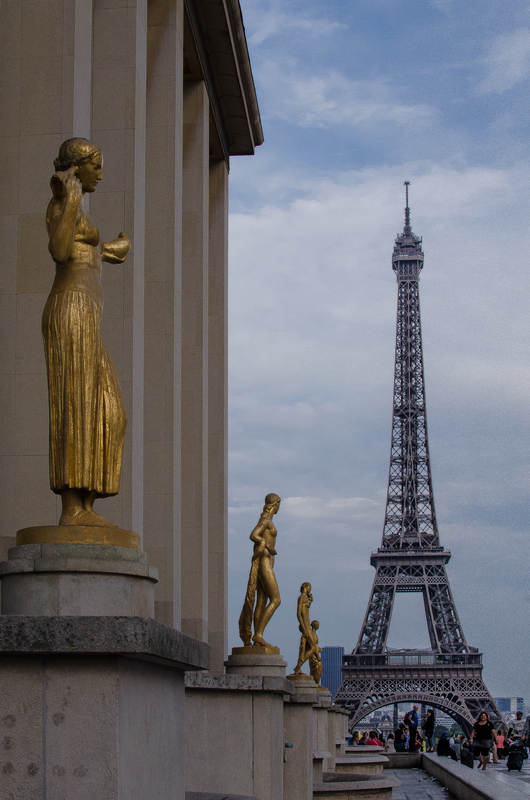 I did, however, resolve to get some unusual shots of the tower for my niece, so I headed out to Trocadero and the Champs de Mar. After shooting until dark at the latter, I decided to pop back over to a cute little restaurant I saw on Rue du Commerce, which is only a couple Metro stops over. The restaurant is A La Tour Eiffel. Good decision. It’s usually packed. Now I know why. As I stand reading the menu outside, I’m immediately drawn in by a dish that sounds like an amazing version of macaroni and cheese, which I love. It’s not too hot tonight, so I go inside, hoping to avoid breathing smoke while I eat. This, while idealistic, is also futile. Of course, a guy plops down at the seat just outside the window and starts chain smoking. I just roll with it. At least there’s ventilation. At this point, the waiter, Thibault, comes over. He’s young, friendly, cute, and cheerful. Within a few seconds, I can tell I’m in for a night of fun. I ask a question in French, and then (since there is no English menu) he charmingly explains the whole menu to me in excellent English, as well as the specials. I notice an interesting Indian salad on the menu. It sounds healthy and delicious. I debate: most of my forays into healthy food here have been disastrous. I decide to go for it anyway. Another good decision: the salad is light and flavorful, and with the dressing on the side, it’s not drowning in sauce. Sort of a Tandoori chicken green salad. What a culinary relief. Honestly, the heavy food here can be a little exhausting, but the chef here has just the right touch. Thibault makes a wine suggestion after I tell him I don’t like it too sweet. 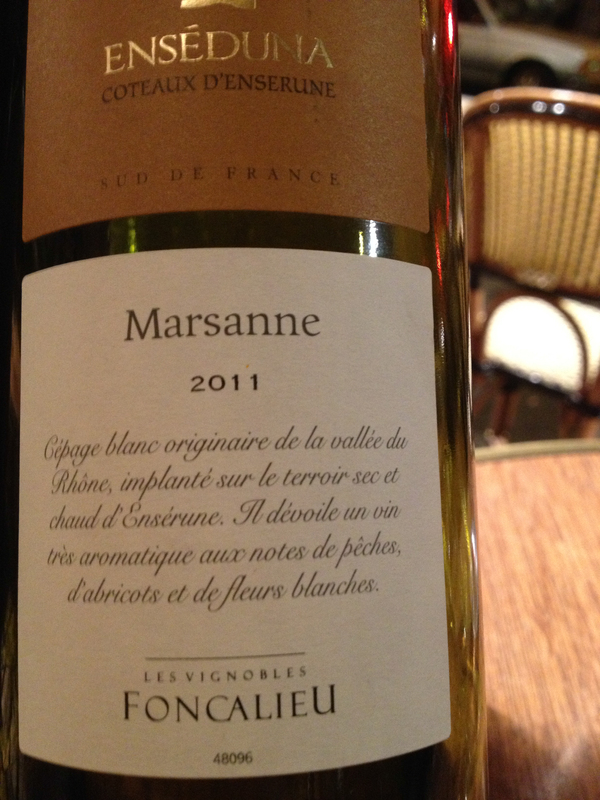 It’s a little white wine from Marsanne, and it’s the best wine I’ve had in Paris. He says, “I’ll tell you a little secret. Look for Marsanne on the label. All wines from there are really good.” Thibault is very wise. I loved it! And only 4.5E a glass. I enjoy a good, leisurely meal, with Thibault chatting me up occasionally, since they’re not too busy. Nice. I tell him the wine is really very good, and he says, “You’re not just saying that to be nice to me?” I laugh and prove my point by ordering a second glass. Which says a lot, because I’m usually a one-drink kind of girl. So now, Thibault has a confession for me: “Now that you say you like it, I’ll admit … I drink it (this wine) every day!” This makes me laugh again. I have him bring the wine bottle back and snap a picture of it, so that I can try to find it back in the States. He obliges cheerfully. I order dessert, an apple concoction, which is also excellent. I linger for a while, and Thibault chats with me some more, helping me with my French. I tell him about my idea … a French language school taught by waiters, since they’ve taught me more French than anybody else here. He laughs. 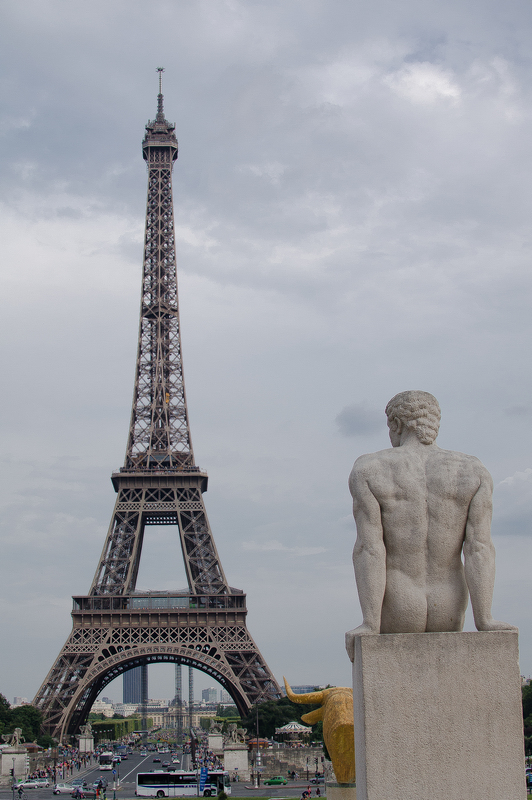 He asks if it’s my first visit to Paris. I say, “no, it’s my second.” And then he surprises me by saying, “I can tell.” Really? I’ve often been surprised in Paris at how these wonderful little moments come at you from out of the blue, without seeking them out. You just have to be open to them, and pay attention so you don’t miss them. Stop and listen. With your eyes, your ears and your heart. I came to Paris, not to see all the tourist-y stuff, but to get a taste of the life. And this was a lovely taste. I’ve been to some nice restaurants in Paris. However, the service, to me, makes the night and the meal. The food here is casual and really good. And the service is outstanding. So go visit Thibault at A La Tour Eiffel Cafe Bistro, and have the same fun I did. On a night where I had entered feeling a little wistful that my trip to Paris would soon be over, I left all smiles. A La Tour Eiffel: Highly recommended. Where: 96 Rue du Commerce, 75015. Metro: Commerce. I like to think that the statue looking at the Tour is really you, basking in the moment. OMG, laughing so hard right now. Yes, it was a good view. I was trying to get non typical photos. I’ve yet to see another photo like that of Le Tour.